An ABC book with edge? 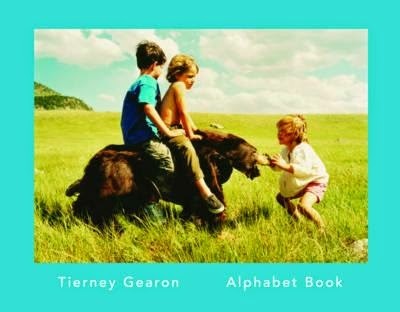 Critically acclaimed photographer Tierney Gearon has reached deep into her retro stash of super cool styling and composition ideas to come up with this photographic alphabet book for kids. Put simply, this is one cool chick. Taking photographs that typically feature her own children, you can just feel the freedom and license-to-be-kids captured in the imagery of this book. From the joyful innocence of fishing in fairy wings to the boundless glee to be found on the trampoline, this is an unfettered, kooky romp through the alphabet. The author isn't afraid to get real, get messy and careen from magical, Alpine vistas to suburban snapshots, peppered with a smidgeon of 'edge', like the little girls toting a giant yellow python in front of a weatherboard house, and the monkey-faced poppets in pink frocks in the car park of a lonely motel. A fabulous find for your Über Cool toddler--or your edgy-cool photography-obsessed self.